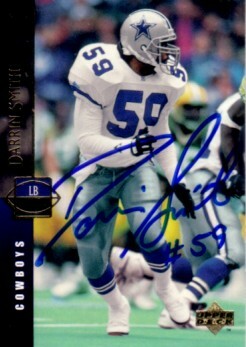 1994 Upper Deck card autographed in blue marker by former Dallas Cowboys star linebacker Darrin Smith, a member of two Super Bowl Championship teams. ONLY ONE AVAILABLE FOR SALE. With certificate of authenticity from AutographsForSale.com.